The Maruti Suzuki Swift is the highest selling B1-segment hatchback in India. 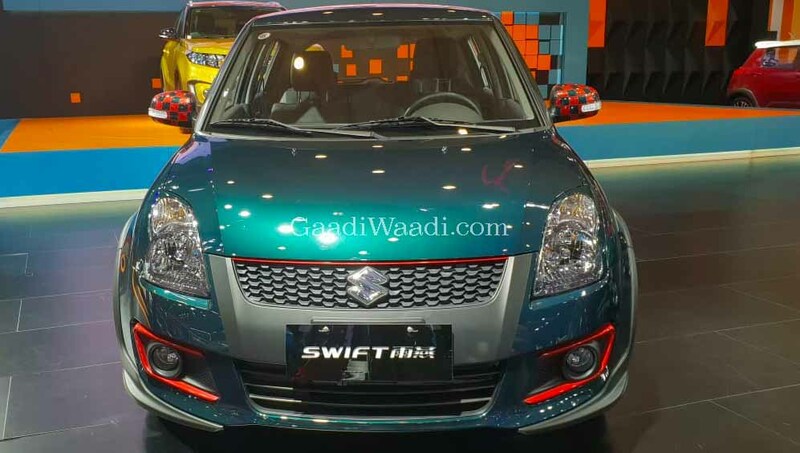 In its third generation now, the Swift has been averaging a monthly sales tally of more than 20,000 units. The third generation model is bolder, bigger, and better than its predecessor. 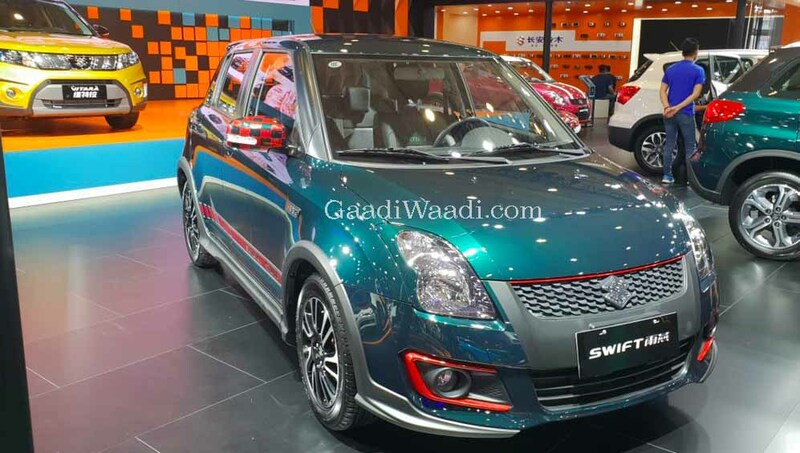 But here’s a modified version of the first generation Suzuki Swift that has a higher visual appeal than the third generation model. 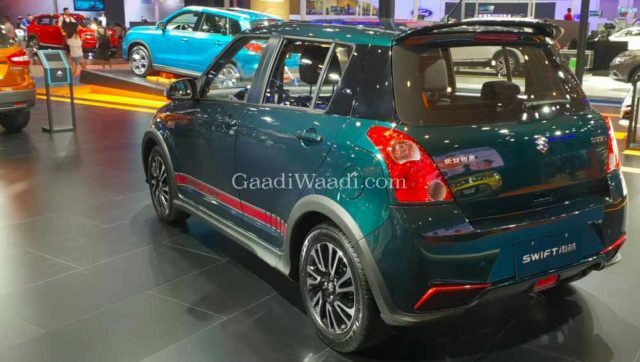 This modified Suzuki Swift has been showcased at the ongoing Chengdu Motor Show 2018. It carries several visual modifications that make it look really good. We feel that these updates are enough to help the old hatchback hide its age. While this Swift carries many updates for the exterior, it’s completely stock on the inside. Hence, you get the same grey cabin that is available on the regular car. The seats get the usual fabric upholstery. 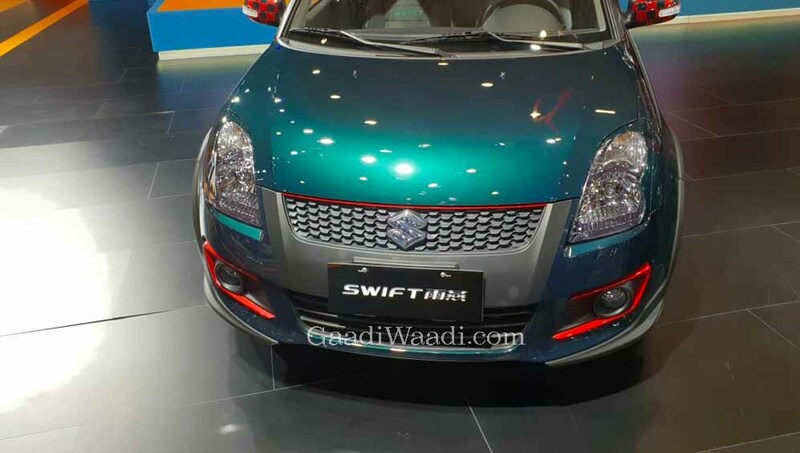 At the front, this modified Swift gets an updated bumper with red accents on the upper end of the grille and on around the fog lamp housings. The headlamp gets partially masked in the body colour to make them look visually different. The grey plastic of the grille and the area around the front registration plate has been left painted while the rest of the car gets a metallic green paint scheme. In the side profile, the car gets a grey-coloured plastic cladding that starts at the front bumper diffuser. It not only makes the front bumper look sportier but also makes the car’s body look a bit wider. 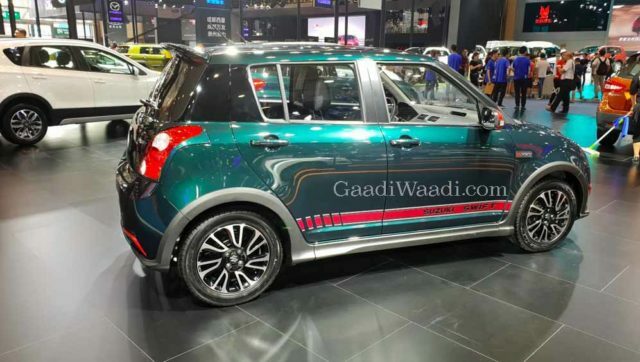 The modified Swift rides on sporty multi-spoke alloy wheels. The side profile also gets red-black chequered graphics on the ORVM caps and body decals around the lower-end. The C-pillar has been blacked out. At the rear, the tail-lamp gets masked to complement the front-end. There’s also a roof spoiler to enhance the sporty appeal of the hatchback. Even the rear bumper gets red accents. Details on the engine aren’t available. From the looks of it, this hatchback carries only visual modifications. But one thing that’s for sure is that these mods make the first-generation car have a higher visual appeal than the third generation version.